On August 10, 2012, author Tom Angleberger loped into the bbgb bookstore on the corner of Kensington and Belmont Avenues in the fan. A wiry man wearing a plaid camp shirt over an R2-D2 t-shirt, Angleberger was unassuming in appearance and words. “I haven’t got much to say, frankly. I’m mostly just about Star Wars and origami,” he claimed. Tom Angleberger signs a fan's book at bbgb bookstore in Richmond, VA. But to his young fans, he had a lot to say. The excited crowd laughed, whooped and hung on Angleberger’s every word as he made large drawings of favorite characters and told each one’s story. Tom Angleberger is the author of seven books for the 10 to 14-year-old crowd. He’s best known for his Origami Yoda series in which sixth-grader Tommy and his friends are trying to figure out how to manage the ups and downs of middle school, turning to a paper finger puppet for advice. The puppet, invented and voiced by their odd friend Dwight, is Origami Yoda. The puppet’s advice always turns out to be really good, but Dwight seems so clueless. Could it be that Origami Yoda really does possess the power of the force? “The reason that I write about a kid who is the weirdest kid at his school is because I was the weirdest kid at MY school,” Angleberger explained to his audience. “I was the second shortest and the most weirdest, so it’s easy for me to write about him. One of the real benefits is there’s no research, right? I already know! I already know what it’s like to be the weirdo. It’s easy! So the book is not exactly my biography, but a lot of it’s true, and Dwight and I do have an understanding with each other. In a one-on-one interview, Angleberger gave more insight into the thing that set him apart in school: Asperger’s syndrome. It is a lucky man who can parlay his two great childhood passions into an actual career. Angleberger seemed astonished and grateful. 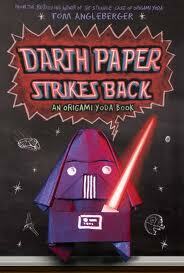 The series began with The Strange Case of Origami Yoda (Abrams, 2010), and was followed by Darth Paper Strikes Back (2011). 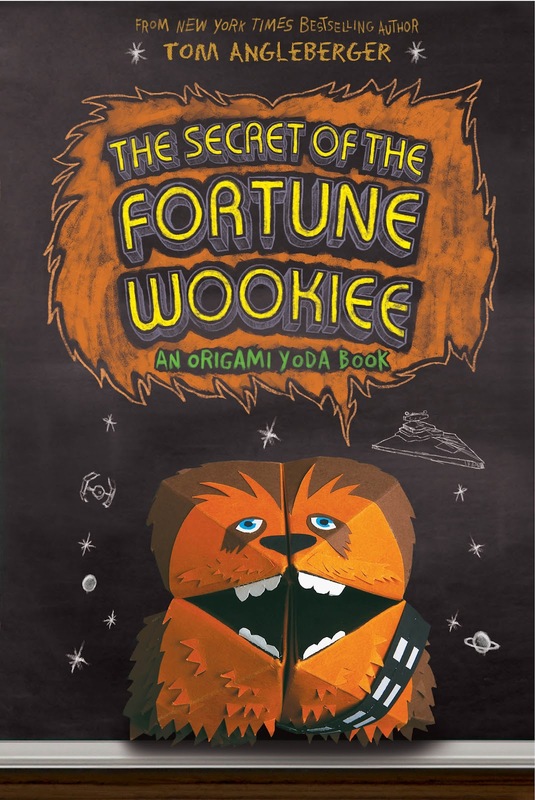 Angleberger was in Richmond to autograph copies of his books and to celebrate the launch of the third Origami Yoda book, The Secret of the Fortune Wookiee (2012). Each story is written as an investigative case file compiled by Tommy, with contributions, doodles and commentary from his classmates. 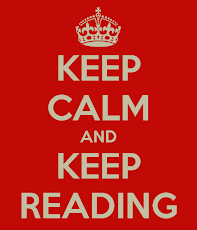 It’s impossible to read a few chapters without feeling like you are also part of the class. The stories are truly that much fun. They’re stooky! Best of all, Angleberger’s writing talent is not limited to this self-made genre; he has written several other creative works which include neither folded paper nor characters from a galaxy far, far away. 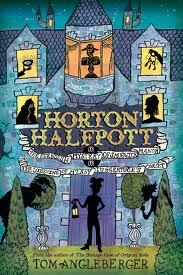 There’s the marvelous story of Horton Halfpott: Or, The Fiendish Mystery of Smugwick Manor; or, The Loosening of M’Lady Luggertuck’s Corset (Abrams, 2011). Its absurdly long title is a good indication of what to expect from this gleefully kooky story. With a flair for wordplay and an expressive vocabulary, our friendly Victorian narrator asserts his opinions with such genteel humor that he is instantly the favorite character in spite of his not actually appearing in the story. The main character is an earnest yet pathetic kitchen boy called Horton Halfpott who is polite and mannerly even while being beaten about the head with a wooden spoon. He and the other employees of Smugwick Manor bear witness to many Unprecedented Marvels beginning one fateful day when M’Lady Luggertuck unconsciously unleashes the Loosening. Fake Mustache: Or, How Jodie O’Rodeo and Her Wonder Horse (And Some Nerdy Kid) Saved the U.S. Presidential Election From a Mad Genius Criminal Mastermind (Amulet, 2012) tells what happens when a seventh-grade boy in possession of an expensive disguise attempts to take control of the United States. The fate of the country rests in the hands of his best friend Lenny and television’s favorite teen cowgirl, Jodie O’Rodeo. This book is a campy encounter of the absurd kind. The happenings in Hairsprinkle are preposterous and playful. 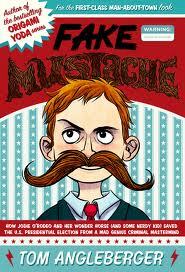 This book may go a long way in reviving the market for false mustaches. Tom Angleberger’s popularity is spreading. Once you’ve seen him in action at a book signing, you know why. This month he will cross the Atlantic to London, taking with him bits of green paper to teach more youngsters how to fold their very own Origami Yodas. Read the interview with Tom Angleberger. It's listed in the October 2012 posts on this site. I love his books! In the Horton Halfpot one, it kept mentioning other books that started with M'Lady Luggertuck. Does anybody know where I can find those other books? Unfortunately, those books don't exist. Note to Mr. Angleberger: we would love to hear more from M'Lady and the gang!